came up with on our club website. held in place with the wires that are already on the marker. come for our regional tour. mini blinds cut up already, it is really fast to make one of the "wings". special or mark something as being "sold out". If thrips are a problem, try growing "White Alyssum"
hybridizer and rarely if ever have thrip damage now. Posted on the "Daylilies for Northern Climates"
Judy Davisson has given us permission to share this post she made to the AHS email robin. "Very little has been said about the benefits of mulch in moderating soil temperatures. 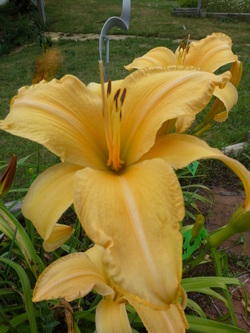 If you have ever received a daylily grown under hot, dry conditions you may have noticed how the crown looks "lumpy" and full of holes and roots are arranged at the very top of the crown. The "holes" in the crown are where roots used to be. During drought while daylilies are under stress, they lose their deepest roots while retaining only surface roots in an effort to seek out whatever surface moisture they can get in order to survive. Then without mulch, these surface roots literally "boil" during high temperatures days when the surface soil gets very hot. In visiting the gardens during the National this year, it was easy to see the benefits of mulch in not only conserving ground moisture but also in moderating soil temperature ..... although all the gardens had been watered, the gardens that were mulched were in much better condition. Both "hot" and "dry" at the same time can do serious damage to daylilies as it takes a longer time for the daylilies to reestablish new deeper roots once weather and soil conditions return to normal. Mulch helps in retaining those deeper roots." height 42", bloom 8", season M, Rebloom, Semi-Evergreen, Tetraploid, Very Fragrant, 29 buds, 6 branches, Cream peach pink yellow polychrome.